Congenital spinal defects may cause caudal stretching of the spinal cord and associated symptoms and signs known as the tethered cord syndrome (TCS). Natural history studies and experimental evidence that have emerged over nearly five decades have contributed to establishing TCS as a valid diagnostic entity. 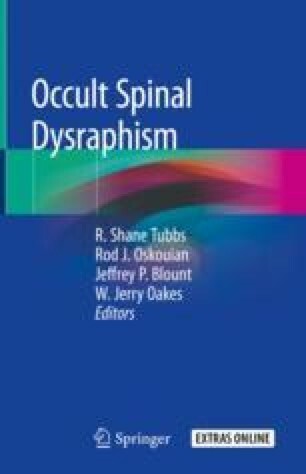 More recently, the existence of an occult form of TCS (OTCS) has been proposed, distinguished by neuro-urologic symptoms suggestive of distal spinal cord dysfunction, but in the absence of both external stigmata of spinal dysraphism and anatomic abnormalities on MR imaging. In the present chapter, we explore the historic and contemporary evidence surrounding the diagnosis and management of OTCS against a backdrop of comparable criteria for the standard of care of TCS. Through these discussions, we highlight important questions that have been raised regarding the level of evidence available to support these diagnoses, in light of contemporary evidence-based medicine standards.